Hey beautifuls, I am sure most of you are fond of makeup, just like me. Being a beauty blogger has its perks, as well as some struggles that we have to deal daily. Our job is to test different makeup products and it may not be that great for our skin. So an essential part of our lives go towards maintaining a healthy skincare habit. 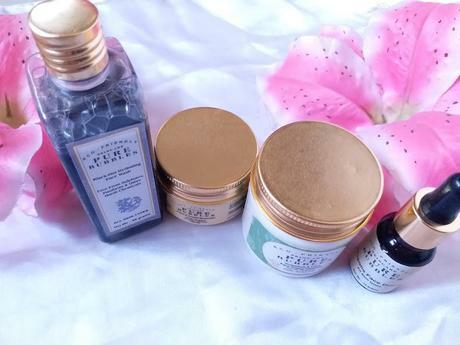 I will not lie I love the Korean style layering skincare but hey then summers in India are very unkind and you dont feel that comfortable in sitting and layering tons of products on your face. So this summer I have adopted a simpler but effective regime for dry skin that I had never done before and for this I would like to thank Pure Bubbles. 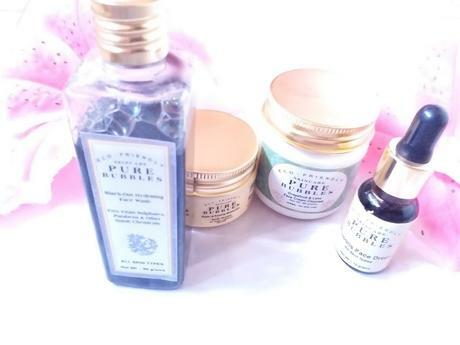 Pure Bubbles is a brand designed with lot of love and care by Bhavana Doshi. It has products designed for all types of skin, which are cruelty free, chemical free and most interestingly handmade. 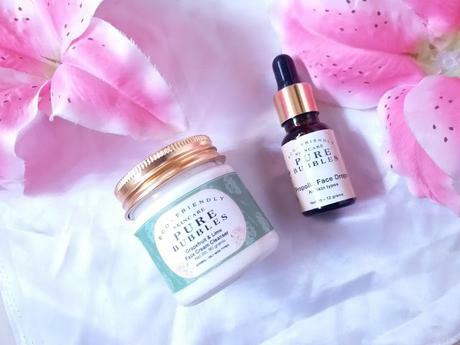 I have always been very particular about my skincare and no matter if I put on makeup or not, I take care to follow a strict skincare regimen with good cleansing and ample of moisturization for my dry skin. Ms. Doshi, after going through my skin texture and concerns had picked and sent specific products that are working wonders for my skin. 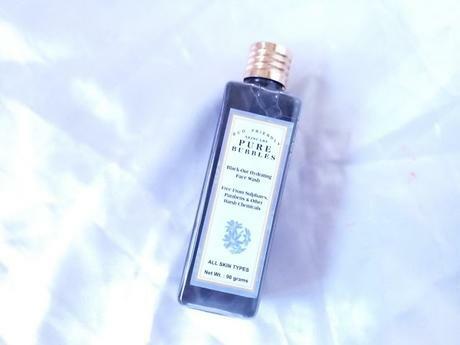 Pure Bubbles Black Out Hydrating Face Wash: If there were no label, one could not believe that this is a face wash. It has the most interesting texture I have ever seen. The face wash is very runny and black in color. You need a very small amount and once you apply and massage it on the skin the runny fluid texture turns so soft and velvety. 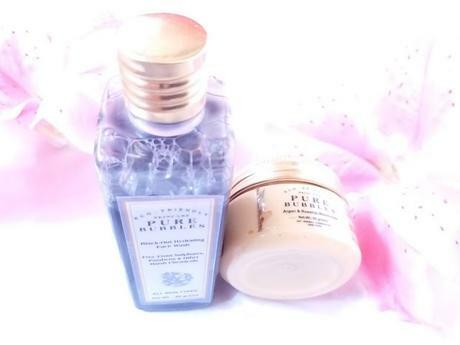 It gently caresses the skin, takes out all impurities and leaves the skin amazingly soft and supple. 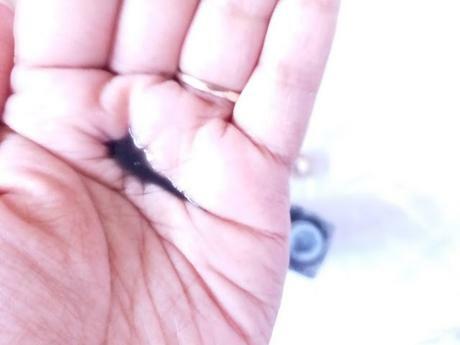 I generally use cream or powder cleansers as I feel face washes make my skin drier, but I have never seen anything like the Black Out Hydrating wash which leaves the skin so hydrated, you actually dont feel that you have applied any wash. I am not exaggerating but I think this texture is quite revolutionary in the face wash world. 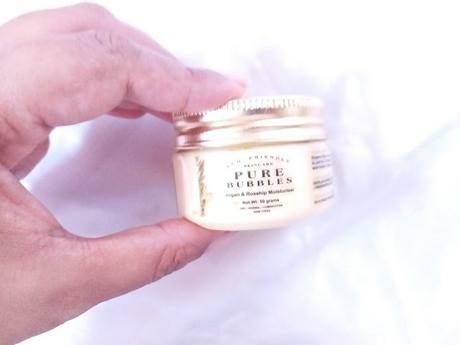 Pure Bubbles Argan & Rosehip Moisturizer: Where to start with it? It is the most emollient, most softening moisturizer I have used in years. 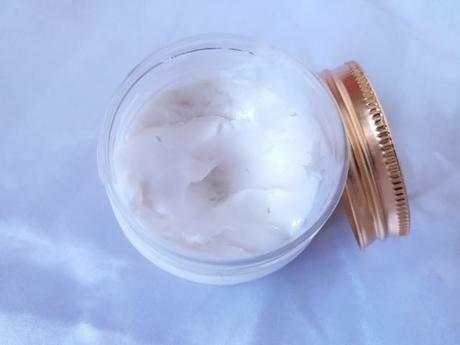 I have been using a lot of cruelty free products for years now, but truly although I have been quite satisfied with their scrubs or masks, the moisturizers were never that interesting, because either they were too light or if I wanted something for dry skin, they turned out to be too greasy. But the Argan & Rosehip Moisturizer is something very different. It is emollient, very moisturizing but not at all greasy. 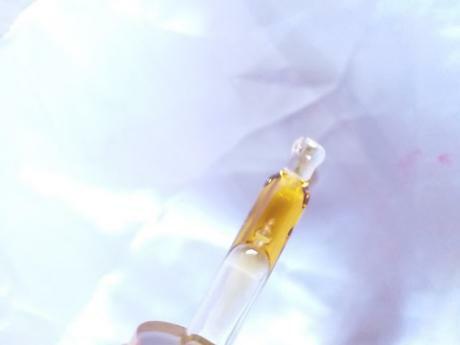 The texture is as soft as butter but not at all oily. Once I apply on my face it makes the skin radiant and so soft. I have never faced that much skin issues other than tanning and uneven skin tone but I can vouch now that my skin had never felt softer than this. After applying the moisturizer, I just use a concealer on areas required and a dash of setting powder, and directly move on to the eye and lip makeup. Thanks to some incredible skincare nowadays, I have completely dared to say no to foundations this summer. 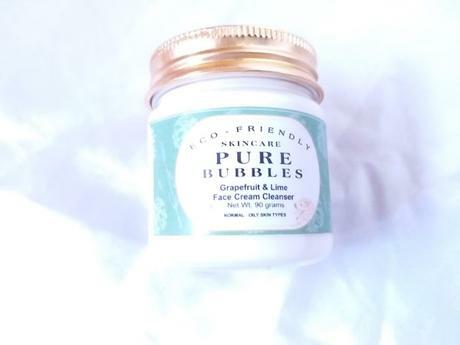 Pure Bubbles Grape Fruit & Lime Cream Cleanser: I have always been partial towards cream cleanser because first I have a notion that they would be better for my dry skin and second they are very rare to find. And I think I am right as this cleanser is an absolute wonder. It can remove light makeup, it makes skin softer and it leaves the skin radiant and smoother too( miracle of Argan & Rosehip). 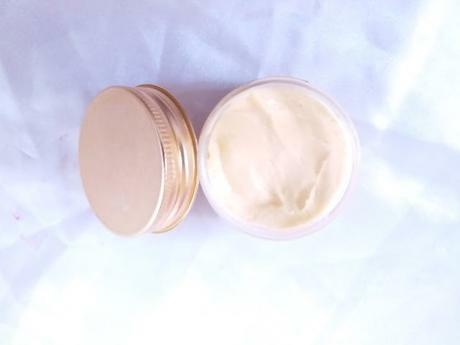 You have to massage the cream cleanser into moist skin gently with finger strokes and then rinse it with normal water. When you massage it takes a frothy form which in turn removes all the dirt & even the makeup residues. 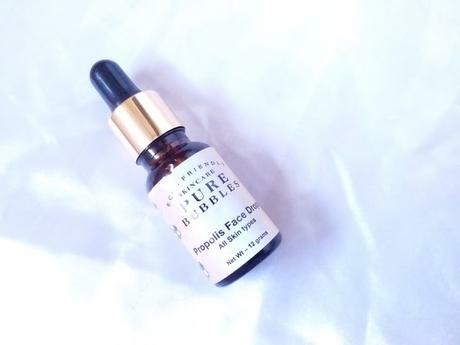 Pure Bubbles Propolis Face Drops: Another very interesting product from Pure Bubbles. This is a serum/moisturizer that hydrates the skin really well. I think it works its way into the skin when you are sleeping as I always get up to a more radiant and illuminated skin. As with all other products this one also is not at all greasy. 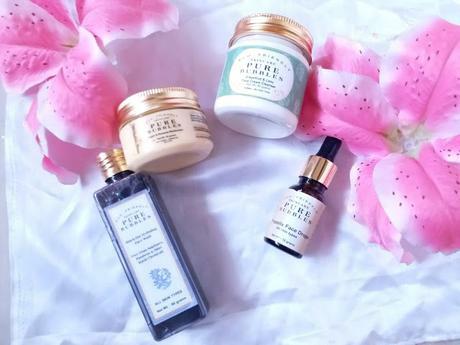 My experience: I would give some pointers about why I would rate Pure Bubbles as one of the best handmade skincare brands. * I have not seen any other brand that has worked so fast to even out my skin tone. I will very soon return with the tri-weekly/bi-weekly/weekly care detail with Pure Bubbles.